Where would you like to stay in Provence? Everybody is different when it comes to vacationing, some people love hotels, luxury villas while others love camping, bed and breakfast, youth hostels or camping cars . Every establishment has a wide range of rooms and prices. It always depends on what you are looking for , in that case prices can increase or decrease and the difference can be enormous, a large room with antique furniture, a television or a balcony with sweeping views , a complete bathroom will cost much more than a poky back room in the same hotel with a window overlooking a car park, no antiques and the WC down the hall. Most two stars hotel have their own showers and WC, most one star offers room with or without. A reminder always book ahead to make your vacation much sweeter and enjoyable!. There are chain hotels in most cities and they are pretty much geared to the business traveler more than the tourist. You can always stay in Relais du Silence, one is Le Mas des Romarins in Gordes, with amazing views of the Luberon and Gordes, it is a five star hotel with great charm!. Also another Relais du silence is Hotel Villa Borghese is located in Greoux- Les- Bains near Aix en Provence and not far from Manosque, the rate is approximately 75 euros ( please check)/ night per room. Also Relais et Chateaux offers more to an upscale clientele. Bed and Breakfast. are usually located in rural areas, there are plenty of opportunities for a stay in a private home or farm. Prices tend to be moderate or inexpensive – Fleurs – du- Soleil offers maisons d’hotes and B&Bs throughout southern France. Gites d’etape and refuges. Most cities have youth hostels and ( Auberges de Jeunesse), they offer simple dormitory accommodation and breakfast. The majority offers kitchen facilities as well or inexpensive meals. They are the best deals for people traveling on their own. Camping is another option as well as camping cars if you want to visit the region. there is at least one campsite in every town, inexpensive and run by the town itself ( camping municipal). Other campsites are graded with stars like hotels, from four to one, at the top of the line you can expect lots of trees and grass , hot showers, a pool or beach, sports facilities and a grocery, a bar and or/ restaurant. Again everything is booked in July and August, beware!. The best time to visit Provence is when the tourist season is over, then you can enjoy and relax in the warm sun!. Each season has its pros and cons. In January the tourists are in the Alps or Pyrenees , in February the mimosa and almonds bloom on the Cote d’Azur . In April and May you can sit outside at restaurants and swim, and within an hour’s drive you can ski at Auron or Isola 2000. By June, the Mistral ( gusty winds) is slowing down and the resorts begin to fill up, walking is safe in the highest mountains. July and August are definitely not the best months to visit, when everything is crowded and temperatures and prices soar and tempers fare!. I will say that it is also the season of great festivals in Avignon, Aix ,Juan les Pins and Nice. Once French school holidays end in early September, prices and crowds decrease with the temperature. In October the temperature is still mild inland and on the coast!. Planning a trip to Provence this coming fall 2017? We offer travel planning, Villa rentals, hiring a private chef, nannies and drivers, the best itineraries, wine tasting, truffle hunting. We also offer private tours and small tour groups ( not more than 12 guests). Contact information and best way to connect is via email: anne@luxurytravelconsultant2.com.Luxury Travel Consultant2. Hiking, cycling & golfing in Provence. Hiking in Luberon and Vaucluse in Provence. A two day hiking trip in Provence will take you from postcard perfect Gordes to the market town of Apt , with an overnight stay in Gordes. Know that you will need a car to travel between Gordes and Apt, and then you can proceed on these hikes on foot. Luxury Travel Consultant2 offers hiking tours to their clients and our tour guides are local and bilingual. If you start from Gordes ( trip / 11 miles), time 2 days; each day hike is about 3 hours ( excluding picnic time). Hike from Gordes to l’abbaye de Senanque. Gordes is one of France’s spectacular villages perches, small Medieval towns that look like they are growing from the hilltops where they were built to protect the inhabitants from invaders. Park your car , bring a picnic along and start your hike in the Place du Chateau in Gordes. Take the second road to the right. Take the second road to the right of the Provencal cafe ( not the D15 to Murs) which leads past the post office. Bear right at the Y junction past the cemetery, continue straight down until the next Y junction and you will turn left down a road lined with with dry-stoned walls – This leads to D15, go straight then turn left uphill until you come across a signpost marked Fontanille by then you should have walked 30 minutes. Bear left by the Fontanille campsite, you should see some mailboxes; turn right when you reach another fork, take the rocky path to the right and continue left along a narrow path with fields to your right. When you get to the Senanque Hamlet you will reach a crossroad go downhill into the woods, at the next crossroad you will find a vehicle -friendly road, just head straight.Cross the road to climb the GR6/97, you will find a path 33 yards downhill toward the Abbaye. The Abbaye of Senanque has seen much death and destruction before becoming the tranquil retreat it is today. It was founded by cistercian monks in the 12th century. Note that the abbaye is closed between 12 ( noon)to 2:30 pm. If you are staying in Gordes stay at Hotel les Bories. http://www.hotellebories.com. If you want to find a great place to dine, go to Les cuisines du Chateau, a nice restaurant in Gordes’ epicerie ( food market ) originally built in the 1850’s. This is one of the many hikes in Luberon, Provence. You can also do a hike from Apt to Saignon! Organized bike tours in Provence. If you go cycling anywhere always make sure that you have sufficient water, food , sun and protection, and suitable clothing and footwear. For Provence visit the site, http://www.cometofrance.com, organizes 3- or 4-day bike tours along the Luberon‘s verdant wine routes. The Garden Golf d’Avignon , is 10 minutes away from centre ville ( downtown). http://www.gardengoldavignon.com ( 9 & 18 holes). The Sainte Victoire Golf club , is an 18-holes golf course stands out from the crowd by virtue of its views, the Mountain Ste Victoire prized by Cezanne. http://www.saintvictoiregolfclub.com. Travel With us to Provence in 2017.
http://www.luxurytravelconsultant2.comLove is in the air, Fall in love in Provence. To taste all the Provence flavors during the holiday season, nothing’s better than the truffles, olive oil ( PDO Aix-en-Provence ) and 13 desserts markets. Do not miss the twin cities’ international market where the twin towns’ merchants , craftsmen and friends meet in Aix-en-Provence to discover their mutual cultural and gastronomic heritage. With its many festivities, its ancient, mysterious and mystical traditions and glittering illuminations, Provence in midwinter reveals another side of itself. It might be very different from the lavender fields, rosé wine and blazing sun of high summer. But, in a very different way, this time of year in the South of France is just as romantic and spectacular. This page tells you where in Provence to find the best Christmas markets, fairs, festivals, exhibitions, pastorales (nativity plays), pastrages (shepherds’ processions) and other events that will light up the landscape in winter. Our attention here is on the main towns and cities, but a number of the smaller villages will also have their own local Christmas celebrations. The area around La Rotonde and the Cours Mirabeau is decked in lights and local stores make a magnificent effort with their festive decorations and window displays. There’s tons more going on in terms of markets and special events. The Cours Mirabeau is lined with children’s fairground rides and around 50 chalets selling gifts, handicrafts and food and drink specials. 16 November-25 December 2016. There is also a Christmas crib of traditional santons in a chalet near the Monoprix department store half-way down the boulevard. The Cours Mirabeau and, the celebrated statue of Good King René in festive guise. The Cours is closed to traffic during the Christmas period. New in 2016: a program of activities around the “three squares” (Madeleine, Prêcheurs and Verdun) in the Old Town. It’s designed to inject life into this part of Aix, which is suffering from the effects of massive restoration works. Among the innovations: a giant Christmas tree and an English-style pillar box for children to post their letters to Santa Claus. In early December Aix celebrates the Fête de la Sainte Lucie, a Festival of Lights of Swedish origin. It starts at the Cathedral in the early evening, and moves on to the place Verdun for traditional Swedish songs and a tasting of something called glögg (Swedish mulled wine). 6-9pm, 13 December. Mid December sees the Bravade Calendale, a ceremonial procession along the Cours Mirabeau with musicians, dancers and folklore galore. 2.30pm, 18 December. This year the santonniers (vendors of Christmas crib figures) are also in the area in front of the Tourist Office, from 18 November-31 December 2016. And it’s still not over in January, when an Epiphany procession, the Marche des Rois, pays homage to the Three Kings (accompanied by their three camels). It starts at 2pm and winds through the streets of Aix, pausing from time to time along the way for a festival carol or folk song. The procession ends with a ceremony at the city Cathedral at 4pm – and no doubt plenty of tastings of the traditional brioche des rois Epiphany cake. 8 January 2017. Christmas is celebrated in more unusual style in Arles during its Drôles de Noëls (Funny Christmases). In the week before Christmas, circus performers, singers, puppeteers, magicians, theatre and firework displays turn the city’s streets and Roman arena into one huge – and entirely free – street-art spectacle. Even the car-parking is free! 21-24 December 2016. For traditionalists, the city also hosts an important santons conference, the Salon International des Santonniers, the largest event of its kind in France. The theme in 2016 is the olivades (olive festival) and there are around 100 guest santonniers from all over Europe – and, this year, from Africa too (expect some stables to feature zebras and giraffes!). It’s held in the Cloître Saint Trophime, 19 November-15 January 2017. There is additionally a more conventional santons market at the Espace Van Gogh, where you can buy the little figurines. 19-20 November 2016. Arles also has a popular early Christmas crafts market, Provence Prestige. It boasts some 150 artisans and exhibitors and in 2016 is held in the city’s Palais des Congrès from 24-28 November. Over the same weekend there’s also a Christmas market in the centre of Arles around the place du Forum. But all that has been changing. And now, after a disastrous failed experiment to scatter the Christmas market all over the walled city, it has been cancelled completely in 2016-2017. Instead the city is working on a street festival aimed at children. The centre piece is a “children’s village” on the place Pie (10-31 December 2016), with performances, parades and concerts at the weekends. Devoted to Provençal history and heritage, the 15th century Le Palais du Route houses a crib and celebratory Gros Souper table. Members of the local folklore association, L’Estello d’Avignon, are delighted to talk to visitors about their traditions. 3 rue Collège du Roure, Hôtel de Baroncelli-Javon. Tel: (+33) 4 90 80 80 88. Avignon’s main crib, one of the biggest in the region is designed by Marcel Carbonel, a leading local santonnier and features over 600 hand painted, terracotta santons in a Provençal landscape, with vineyards, olive groves and hilltop villages. It’s displayed, as in previous years, in the Eglise des Célestins on the place des Corps Saints, where a santon-makers‘ village will be installed. One of Avignon‘s oldest and most notable cribs is on view in the Cathedral, Notre Dame des Doms. Its large wax santons were first fashioned around 1830 by the Carmelite order and its nuns continue today to maintain and restore these fragile treasures (many of their costumes are originals). Place du Palais. Tel: (+33) 4 90 82 12 21. The princes who once controlled Les Baux de Provence claimed to be the descendants of Balthazar, one of the Three Wise Men, and the 16-pointed silver star which guided the kings to Bethlehem is still on the municipal coat of arms. So you expect Christmas in this stunning hilltop village to be something special. The highlight of Christmas in Les Baux de Provence is Christmas Eve, when festivities begin at 2pm with an aubade, or procession of sheep, shepherds, musicians and dancers through the village. 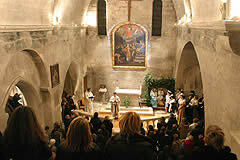 Midnight mass is celebrated from 11.30pm in the beautiful 12th century Saint Vincent’s Church (pictured). During the service, traditional musical instruments accompany Provençal songs and a human crib populated by locals dressed in folk costumes, while shepherds converge for the pastrage to bring the baby Jesus a gift of a new-born lamb. Les Baux also holds a santons fair in October at which santonniers demonstrate their art at locations all over the village. In December there are workshops at which children can make their own Christmas crib figures. 17-23 and 26-30 December. The village’s large santons crib has a different theme and geographical setting each year. In 2016 it’s created by artist Pauline Ohrel out of delicate wire netting. It has the perfect location: the 17th century Chapelle des Pénitents (Penitents’ Chapel) decorated with huge murals (1974) by Yves Brayer depicting Provençal shepherds as they celebrate Christmas. Another little shepherd is the hero of an exhibition of charming illustrations by Jean-Marc Rossi telling the story of a young local boy who one night, while tending his flock, sees a new star in the sky… At the Hôtel de Manville, 17 December-3 January 2017. Children will also love the impromptu sheepfold on the church square where young shepherds tend their flock, herd the sheep daily through the village at and answer questions about their work. It’s on every day from 17 December-3 January 2017 (except 25 December and 1 January). There are various Christmas-themed activities happening within the precinct of the Château des Baux too throughout the school holidays. The picturesque coastal town of Cassis has a Christmas market right in the centre of town on the place Baragnon. 2-11 December 2016. Part of this square becomes an ice rink for the duration of the cold weather. 17 December-26 February 2017. Dating back to 1803, the Marseille Foire aux Santons is the very oldest of them all and opens in mid-November. At the official inauguration, a santonniers‘ mass is celebrated in Provençal at the church of Saint Vincent de Paul, followed by a procession down the Canebière to the sound of the tambourin, a long, traditional drum. Some 30 santonniers display their wares in chalets on the place Charles de Gaulle and along the Canebière. In 2016 Marseille’s Foire aux Santons runs from 20 November-31 December. The city’s Christmas craft market on the Old Port offers ceramics, traditional Marseille soap, wooden toys, sweets, cookies and chocolates. 20 November-31 December 2016. For children, there are roundabouts and other attractions on the Old Port, the Cours Belsunce and the place Léon Blum near the top of the Canebière as well as the Giant Ferris Wheel on the Old Port itself. Weekends are spiced up by street entertainment: this year it features Santa’s elves, a parade led by Mother Christmas, gospel music, capoeira and more. The city’s Christmas illuminations are switched on on December 2. Saint Rémy de Provence holds a little “Nocturne de Noël” – sometimes referred to as the Fête des Lumières – in early December, when the town’s illuminations are all switched on. Shops in the centre of town are open late and live music, mulled wine and soup are on offer. In 2016 it’s on 10 December. Saint Rémy’s main Christmas market is held just before Christmas on the place de la Mairie and offers crafts and santons, plus the ingredients for the seven dishes and 13 Desserts of the gros souper or Great Supper traditionally eaten in Provence on Christmas Eve. 16-18 December. Also in the run-up to the big day, there’s a performance of the pastorale an open-air dance celebration and bonfire and on 24 December a midnight mass. Toulon has a daily Christmas market of around 40 chalets on the place de la Liberté from 25 November to 31 December 2016, plus a large, animated crib of over 700 santons. Look out for the city’s Mont Faron Cable Car! On the place d’Armes is a giant skating rink. 7-31 December 2016. At weekends throughout December there are festive parades through the town, climaxing in the arrival of Santa Claus on the port on Christmas Eve. Set in the rolling Alpilles hills south of Avignon, Saint Rémy de Provence is one of the region’s favourite holiday destinations, with its pretty old town, boulevard cafés, many colourful festivals and traditions and two important tourist sights, the huge Roman ruins of Glanum and Saint Paul de Mausole, where Vincent van Gogh spent the last year of his life. You can read about all this and more below in our guides to the town, to Saint Paul and to another of Saint Rémy’s most popular attractions, its superb Wednesday morning street market. Celebrate romance with us in Provence 2017. Click the link below and book today!. Luxury Travel Consultant2 and upscale travel. What our Tour packages offer. Activities include wine tastings as well as a visit to an organic truffle farm, appetizers and champagne will be served. A visit to one of our favorite spots ” La Camargue” a wildlife sanctuary for all kinds of birds as well as wild horses and more. Our prices are pretty competitive and very affordable!. The only thing that is not included is Airfare and they are some very low fares right now. On occasion we offer 2 free tours in exchange for 10 guests, two of the guests each bring 5 guests to travel with them. Air Fare not included!. Two tours in January 2017 and November 2017. January 21, 2017 – January 28, 2017. 12 guests are invited total and two win a tour each to spend a week in Provence when they bring friends along. November 18, 2017 – November 26, 2017. 12 guests are invited total and two win a tour each to spend in Provence. “The entire group really enjoyed themselves; It was peaceful, beautiful and well orchestrated. If we wanted to change a plan , she was flexible with the group. All checklists you can think of on a trip like this were all met and surpasses and helped us have the trip of a lifetime”. Kate & Ted Smith, San Francisco. (They brought a group of friends with them and Kate & Ted got to stay for free). Hoping that we made ourselves clear with our description. At Luxury Travel Consultant2 we work very hard to make your vacation a dream!. Anne Suire is the founder of Luxury Travel consultant2, it is an upscale travel company online offering leisure travel services, travel planning, luxury rentals in France and Italy. At Luxury Travel Consultant2, Suire strives for client satisfaction by providing the highest level of service delivering detailed oriented travel & tour plannings. Suire believes that the key to success lies in nurturing the clientele as well as anticipating their needs and conveying happiness for the clients. The goal is to brand the company as a provider of ultimate travel and tour planning experience while becoming a one step shop for every travel service available. Drivers / bilingual tour guides. The villa usually comes equipped with everything from barbecue to swimming pool. *for more information contact anne@luxurytravelconsultant2.com and start planning your ultimate vacation. Integrity – Committed to honesty, loyalty and high standard of ethical conduct. Customer focused . committed to providing the highest level of customer service. Luxury Travel Consultant2 believes that success depends on the leadership and management ability to focus and execute the mission on schedule. Teamwork- Luxury Travel Consultant2 believes in building long terms relationships with preferred business partners to achieve mutual success. Excellence – Luxury Travel Consultant2 is committed to staying focused on total customer satisfaction. Luxury Travel Consultant2 is a one woman operation who just do a few groups a year and plans trips to France, Italy and Spain. A sanctuary to visit during our Thanksgiving Tour 2016, La Camargue. The river and the sea have created an almost lunar landscape over which the huge tour de Constance of Aigues-Mortes stands guard. Arles looks out the Grand-Rhone to the huge expanses to the west which have some of the most famous, a great alluvial flat of marsh, lagoon and farmland between the two branches of the Rhone. The area has assumed an identity of its own and due to its unique character is now a national park in which landscape and wild life are protected. Before flowing into the sea just after Arles, the Rhone forms the delta where gypsies believe two saints named Mary were washed ashore. Caravans and trailers are parked against the sea wall, while high-spirited bulls wait for the feria in their enclosures. A single main road runs past the rice fields and peaceful pools with pink flamingos and across salt marshes crisscrossed by narrow paths. We will stop at the Abbaye de Montmajour , which in AD 948 was a community of hermits, built among the marshes. The abbaye became steadily wealthier and added on a cellar, a church, a refectory and chapels. But for all its wealth , starkness was de rigueur in the abbaye, only the capitals in the cloisters were adorned. We will spend time in Arles , which will give our guests a little foretaste of Spain with its blend of Roman, Romanesque and baroque. Aigues-Mortes, a port king Louis IX built in 1848 will also be worth the stop. Stes-Maries-de-la Mer famous for the legend of “the two Marys”. Lunch will follow and we will get to enjoy a fish stew at Marius Bernard, the restaurant serves traditional Provencal Fare!.